Made for telescoping for different lengths, with anti-slip tape on the loading surface for traction. 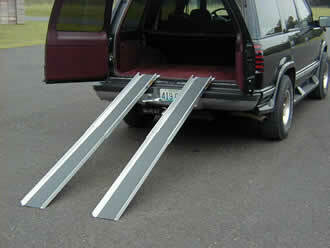 You can use the TWC-7 for loading wheelchairs in vehicles and also for getting up steps. A 2pc. set allows you to adjust to fit most wheelchairs. ©2001 Five Star Manufacturing, Inc.